Timetables. 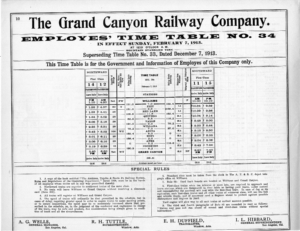 Among the most useful company documents are timetables, both employee and public. 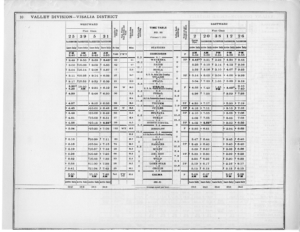 Employee Timetables were printed for each division and updated regularly, often as many as three times a year. 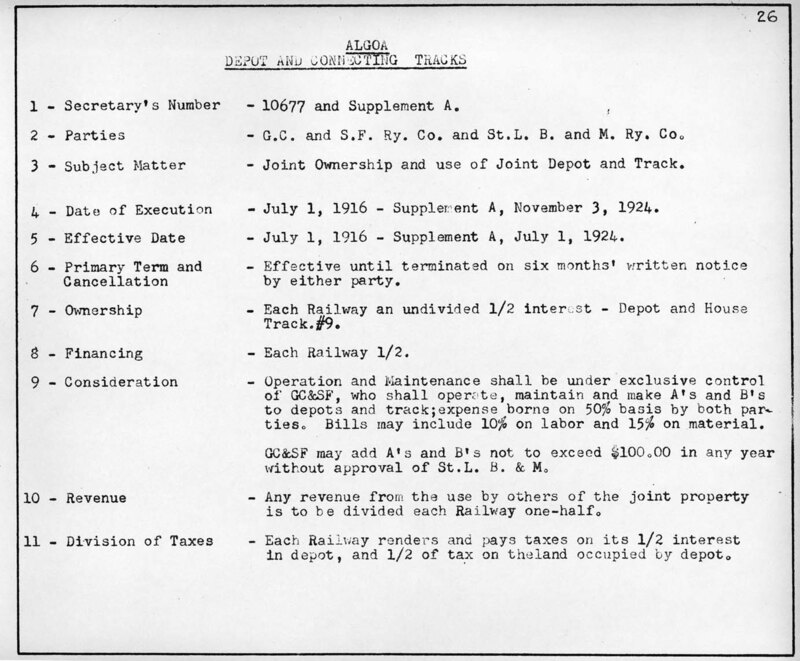 In addition, in the interim when changes occurred, supplements were issued only for those portions of a division that were affected by the change. 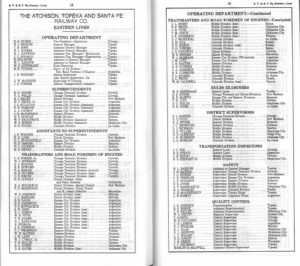 The Society has reprinted employee timetables for the entire system for selected years from the extensive collection in our archives. 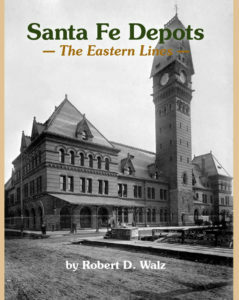 Here are timetables from two divisions of the coast Lines of the Santa Fe from 1915. Check back to this page, as we will change them regularly. To see the full-size image, click on the thumbnail. 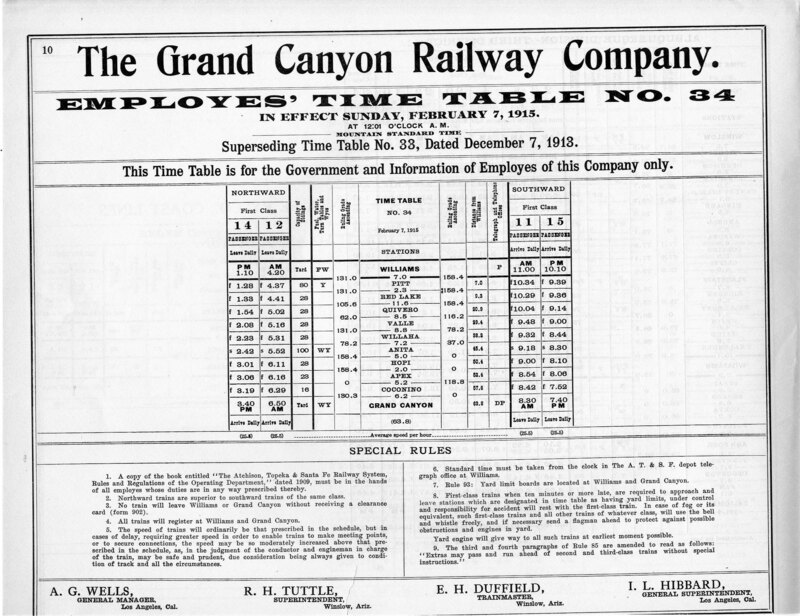 Trains of the Grand Canyon Railway effective February 7, 1915. 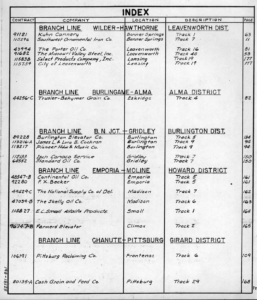 Trains of the First District Albuquerque Division effective February 7, 1915. 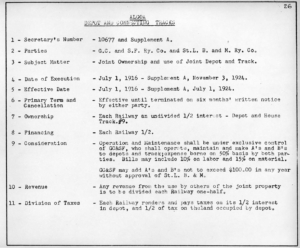 Form 598. 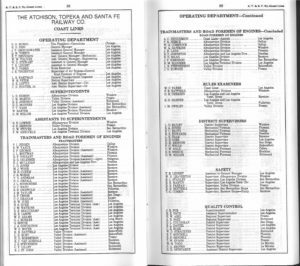 Form 598, a booklet of approximately 200 pages, lists all officers, agents, stations, stock yards, and scales of the entire system. Updated periodically, it is a very useful document for researchers. 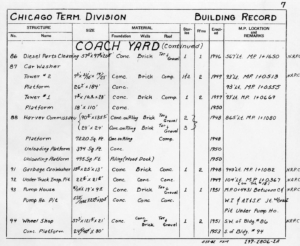 One can find out what officers were in the company, grand division and division headquarters. 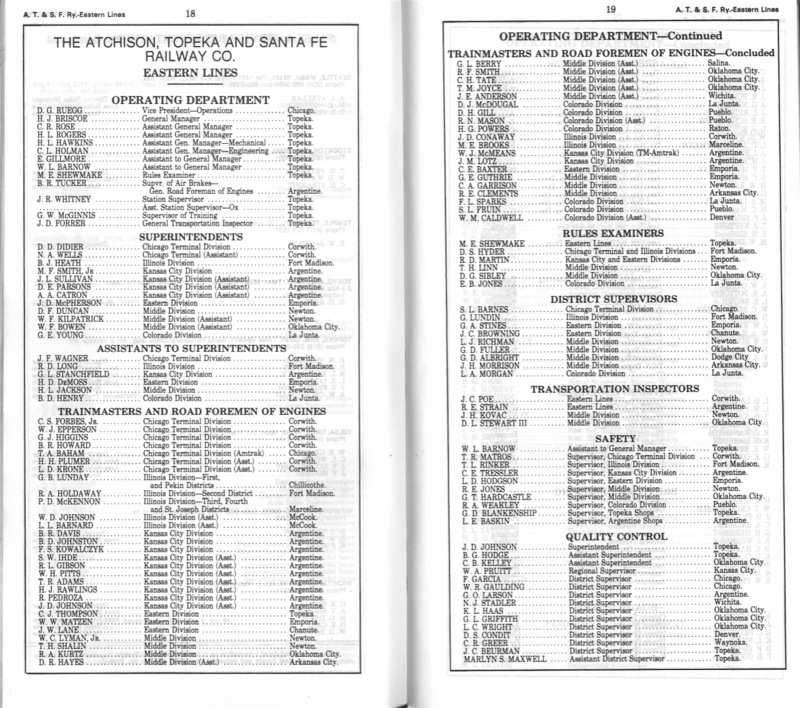 It also lists all the stations and the agent’s name for all main and branch line districts. 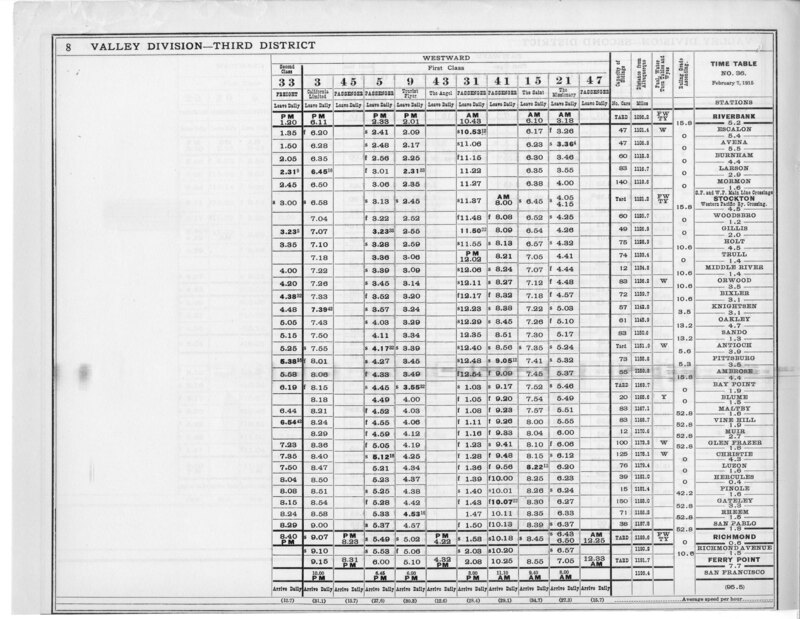 In addition, it lists all the stock yards on the system along with size of the pens, capacity of the stock yard track and other pertinent data. 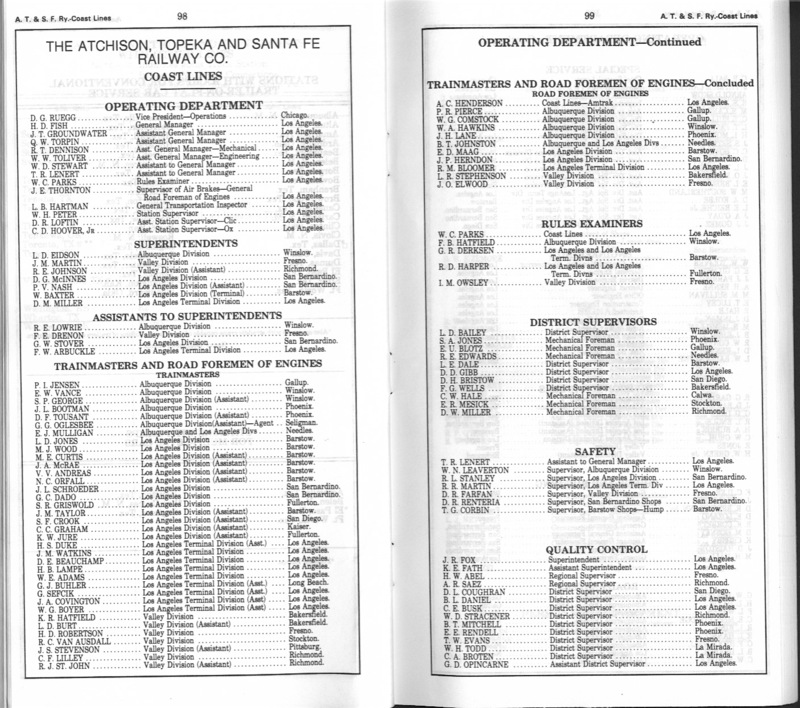 Here you will see two pages for each Grand Division from the July 1979 issue. To see the full-size image, click on the thumbnail. 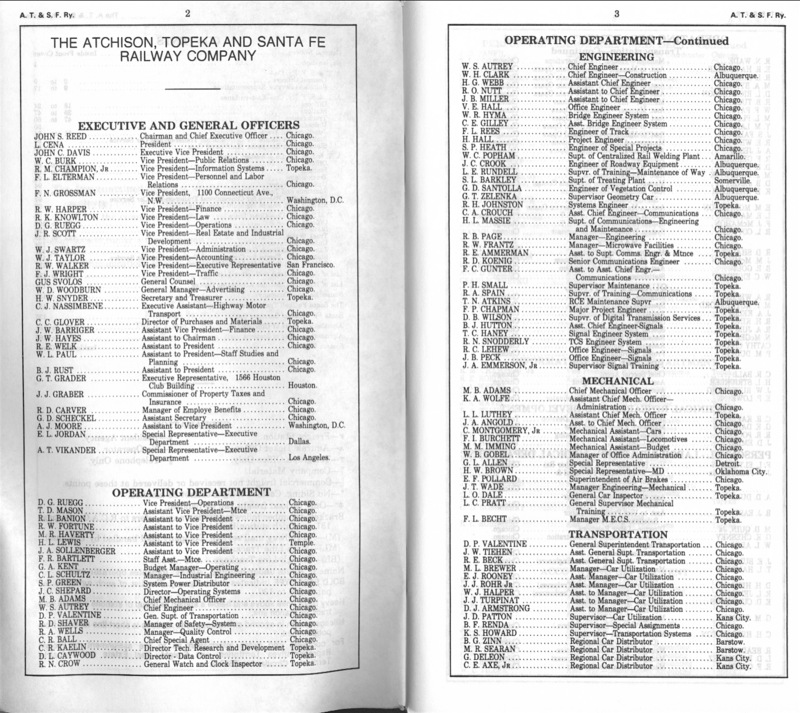 These two pages list some of the officers of the Railway who had their offices in Chicago. 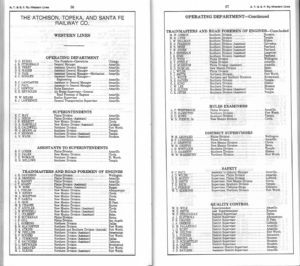 These two pages list some of the officers of the Eastern Lines Grand Division headquartered at Topeka. 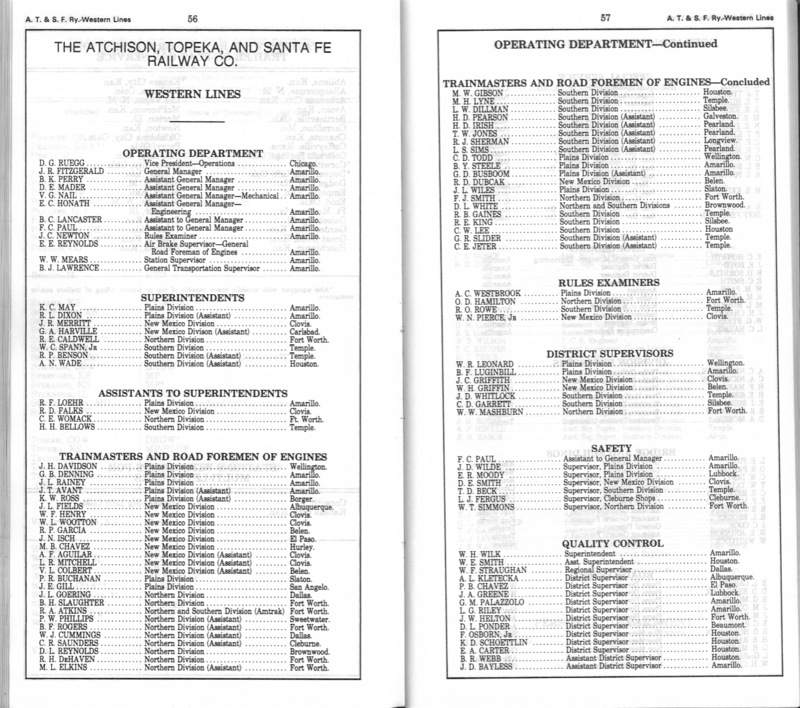 These two pages list some of the officers of the Western Lines Grand Division headquartered at Amarillo. 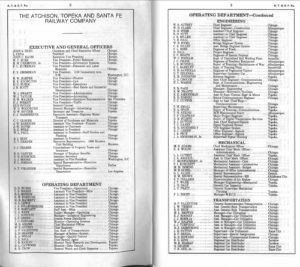 These two pages list some of the officers of the Coast Lines Grand Division headquartered at Los Angeles. Building Records. 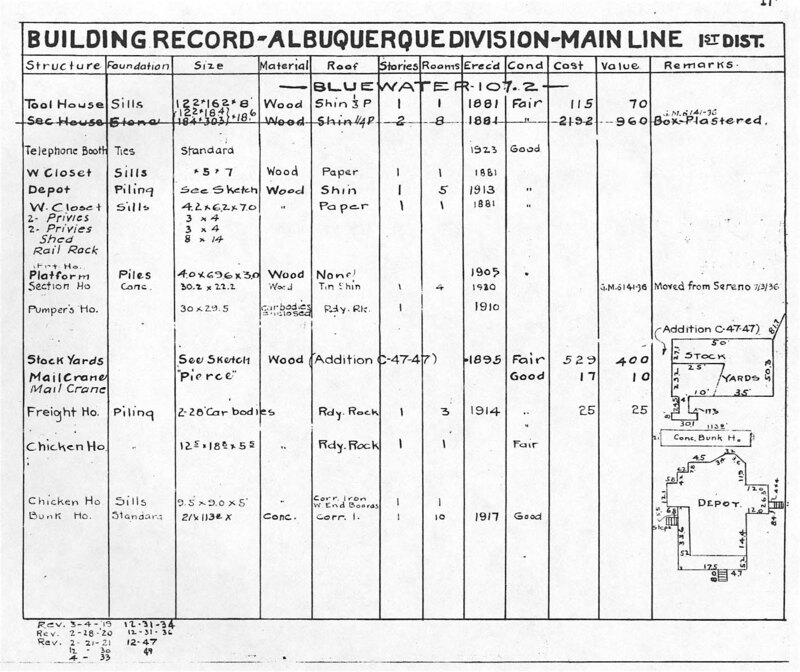 The division engineer was required to keep a record of all structures on a division. While the form used differed somewhat on the Gulf Lines and the Coast Lines, all records included location, type of structure, size of structure, material used in the construction, number of stories, number of rooms, when erected, and remarks. 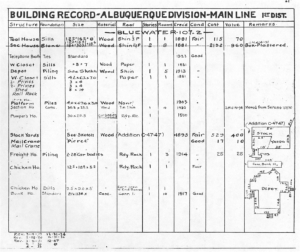 Below are some sample pages of Building Records from the Albuquerque Division and he Kansas City and Chicago Terminal Divisions. To see the full-size image, click on the thumbnail. 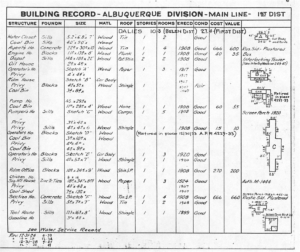 Building Record Dalies, New Mexico, corrected to December 30, 1949. 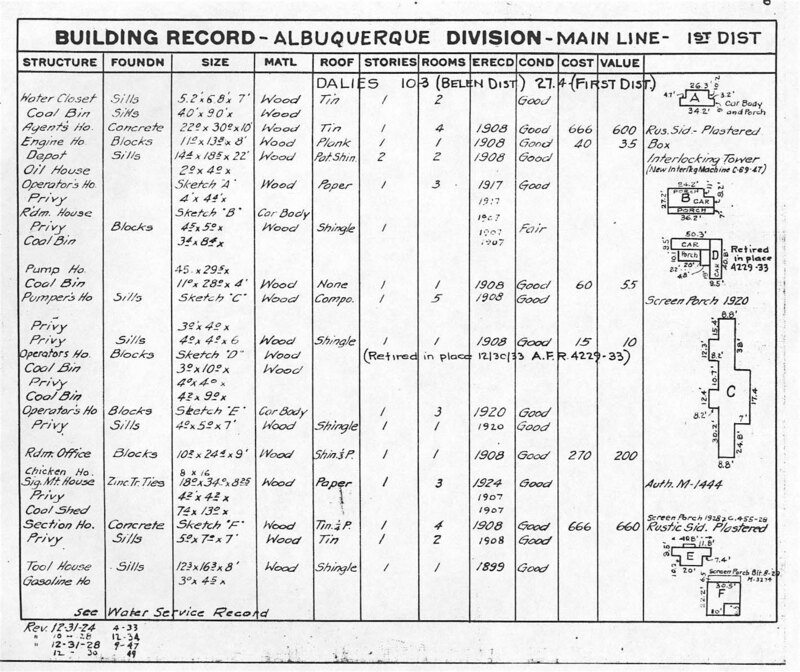 Building Record Bluewater, New Mexico, corrected to December 30, 1949. 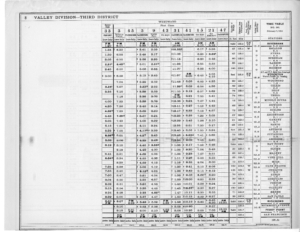 Argentine Kansas City Terminal Building Record effective 1982. 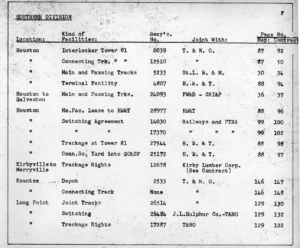 Joint Facilities Records. 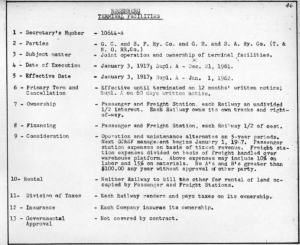 These records, in table form or as an index and contract summary, list the facilities that are jointly used with another railroad or railroads. 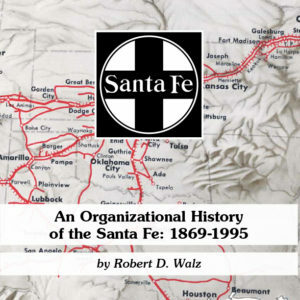 The Society has examples from the late 1960s and early 1970s covering five divisions. 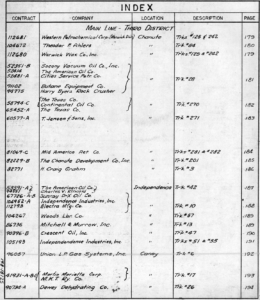 It appears that each grand division maintained the records in slightly different formats. 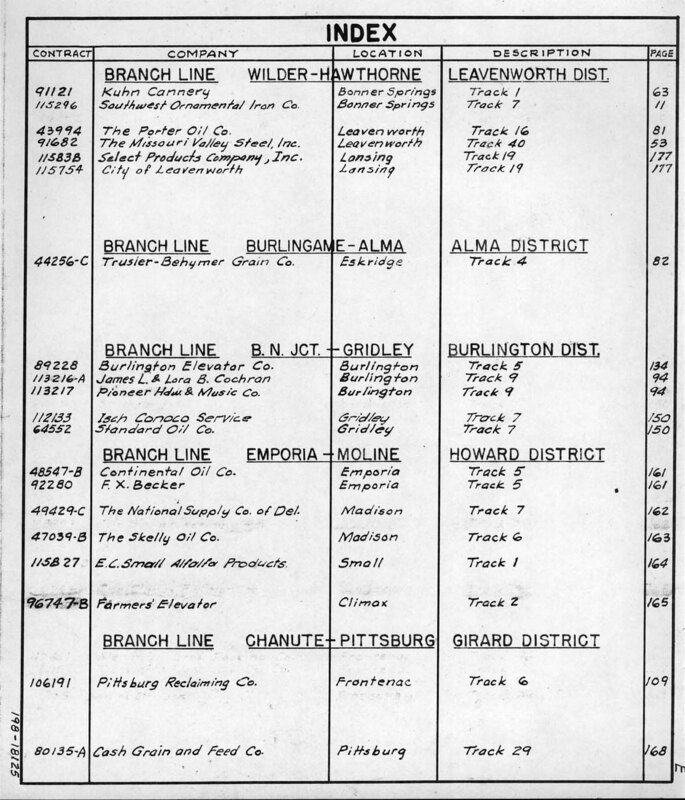 The Eastern Lines kept an index in two categories, billing list and voucher list, along with the maps. 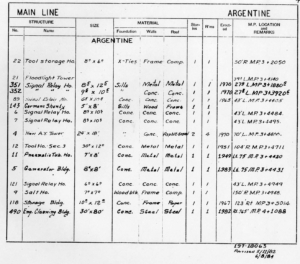 The Western Lines kept a table and a map. 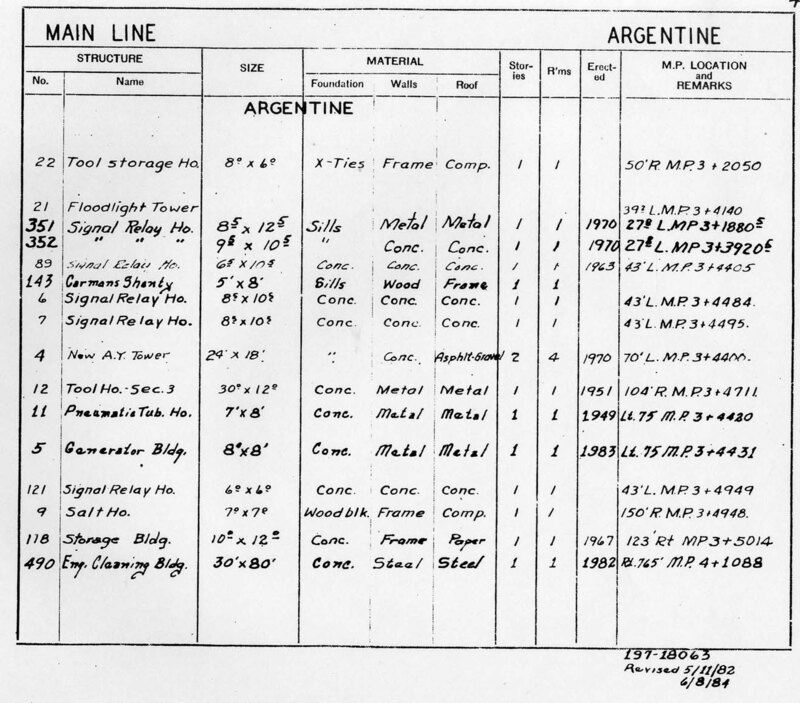 The Gulf Lines maintained a summary record of the contract and a map. 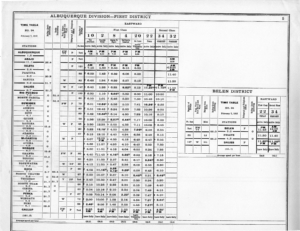 The line maps are shown on the maps and charts page. 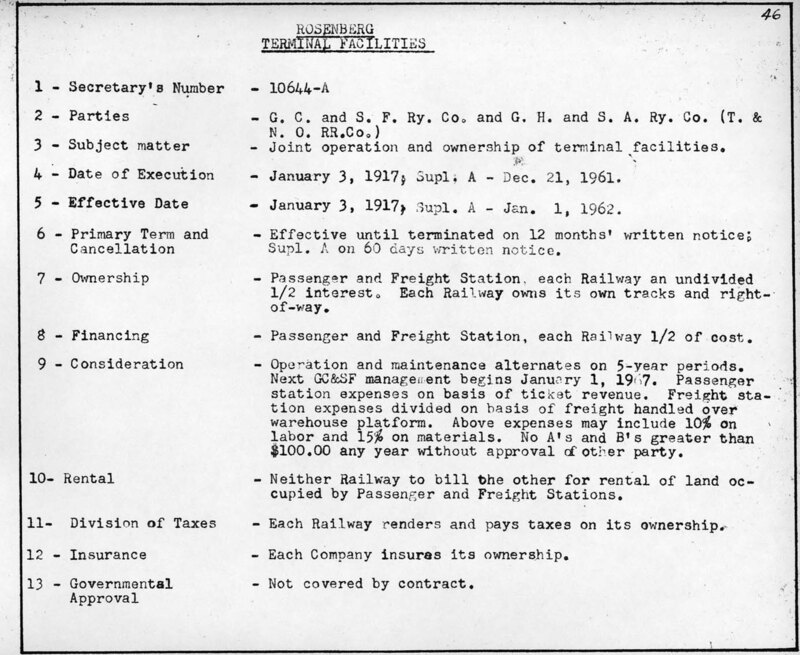 The arrangements with the other railroad is governed by a contract and all details are spelled out in the contract. The remarks section of the record summarizes the important points. The ones here are all from the Southern Division. To see the full-size image, click on the thumbnail. 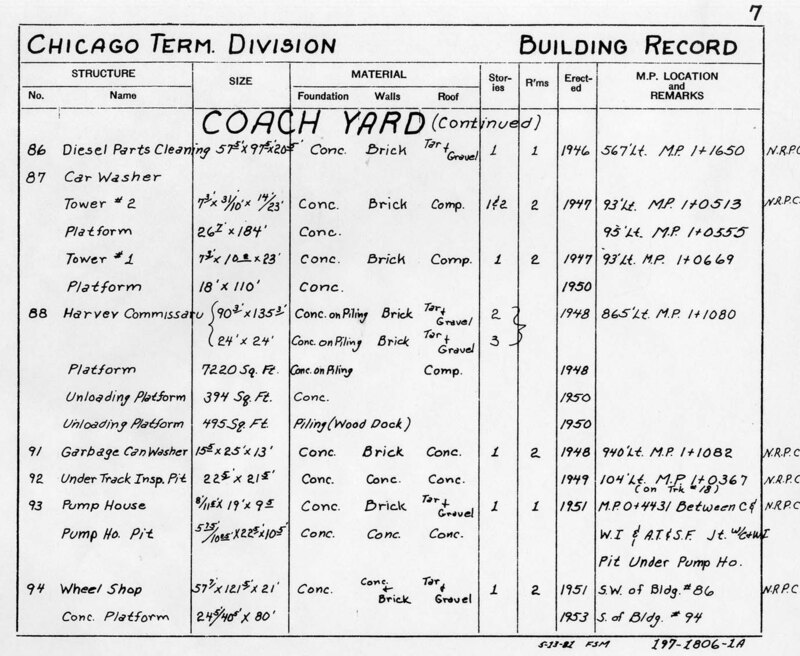 Joint Facilities Record, Index Southern Division, corrected to June 1, 1976. 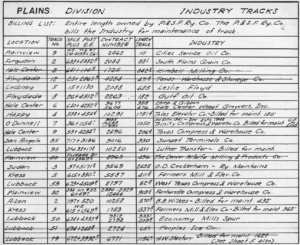 Industry Track Records. 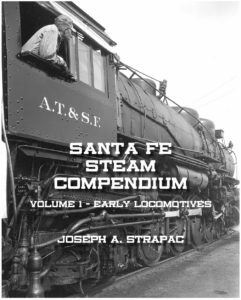 These records, also in table form, list industry tracks that are maintained by the Santa Fe and/or another entity, usually the industry served. 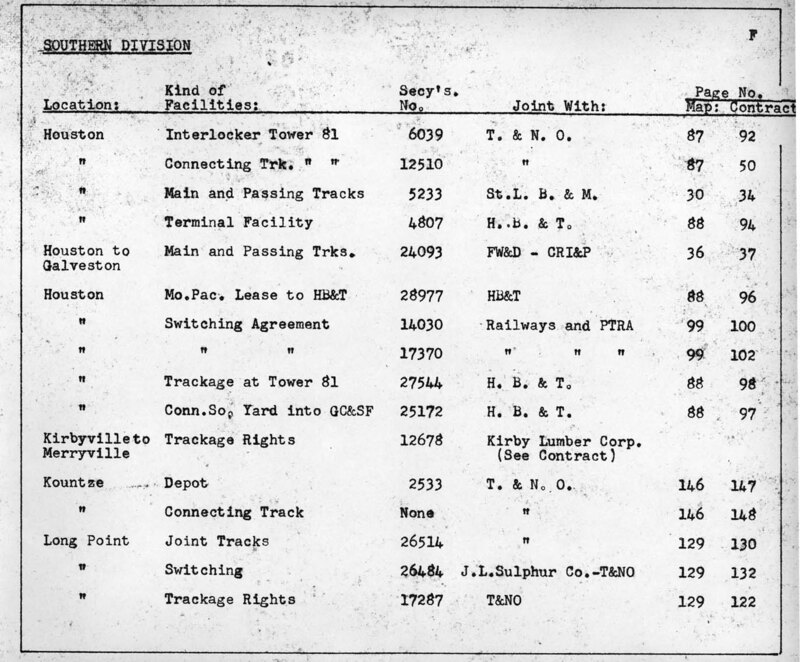 Like the Joint Facilities Record, each grand division handled the records a bit differently. 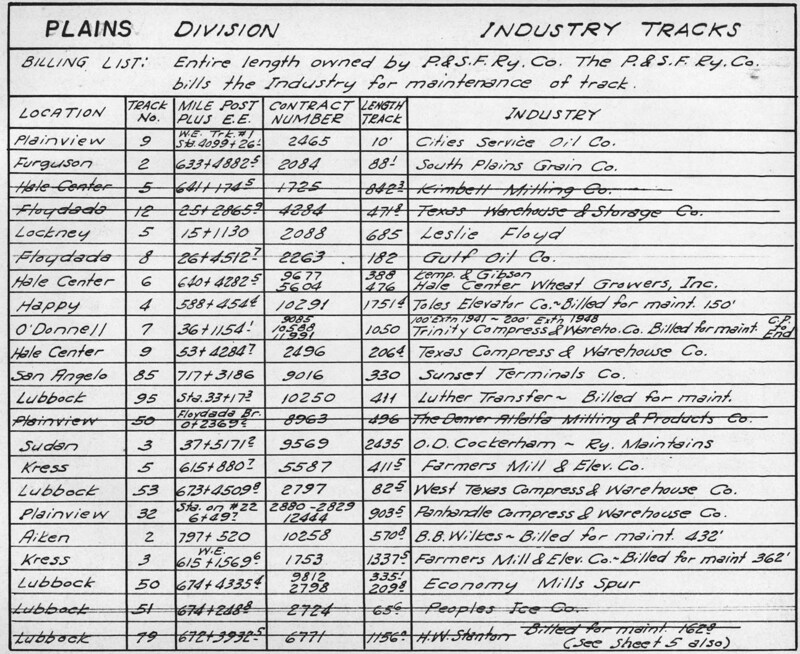 The Eastern Lines listed the industries in an index while the Western and Coast Lines maintained a table. 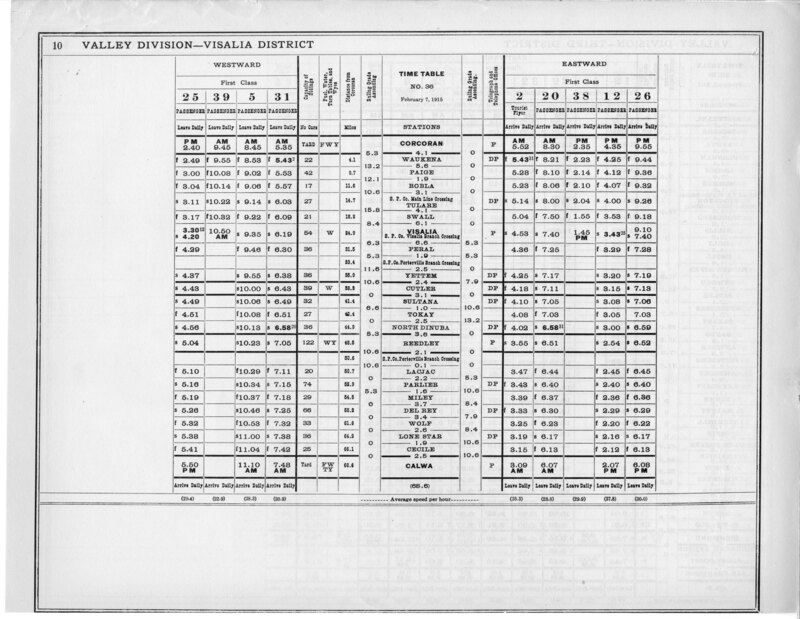 The Gulf Lines only had an index of stations referring to a map. 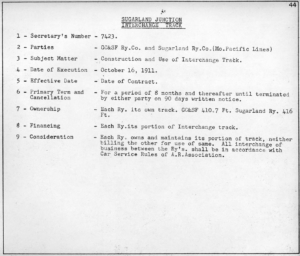 The arrangements are spelled out in a contract. The remarks also summarize important points of the contract. 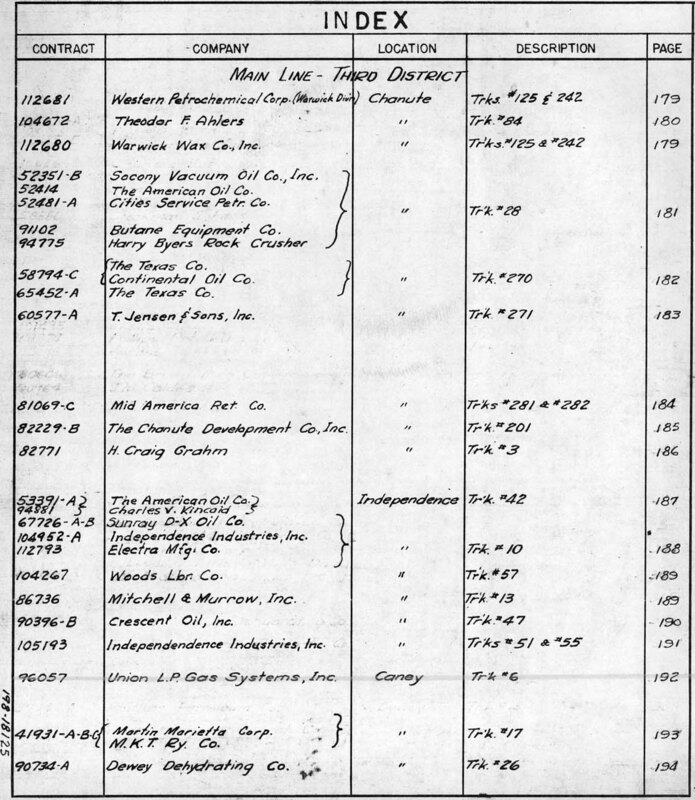 There can also be a line map for industries with these records. 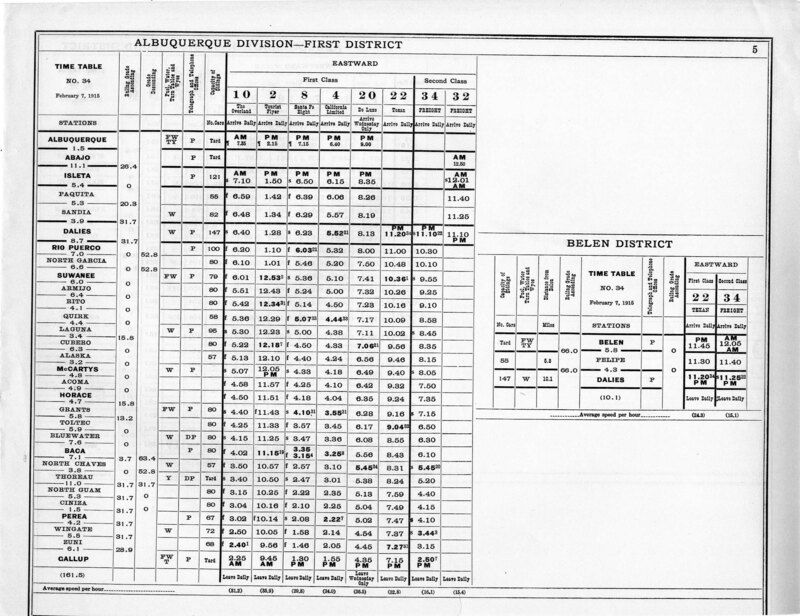 The line maps are shown on the maps and charts page. To see the full-size image, click on the thumbnail. 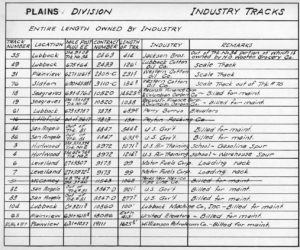 Index of Intudstry Tracks, Eastern Division, revised to December31, 1969, p. E.
Index of Intudstry Tracks, Eastern Division, revised to December31, 1969, p. F.
Partial list of Industry tracks on the Plains Division corrected to June 6, 1976. 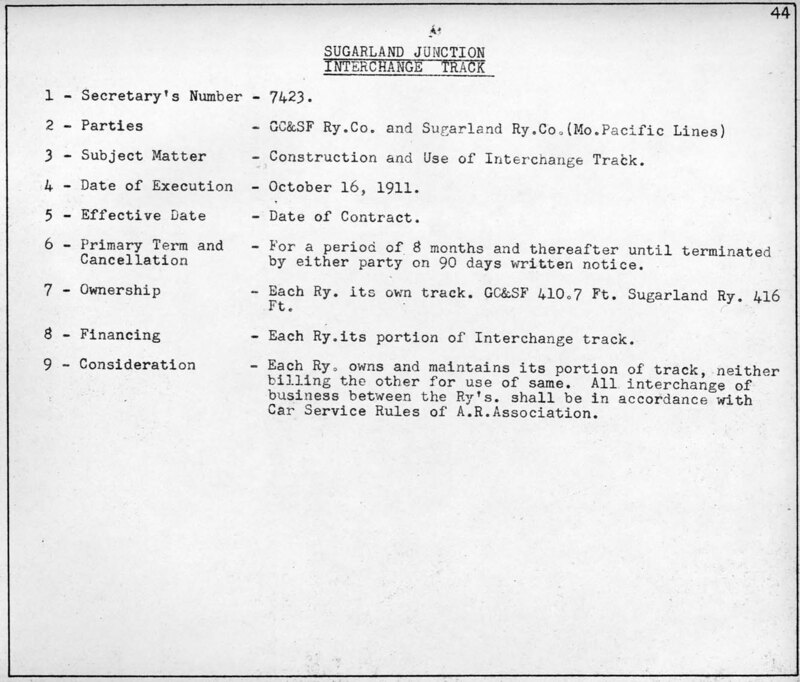 Entire length of track owned by P&SF and the railroad bills the industry for maintenance of the track. 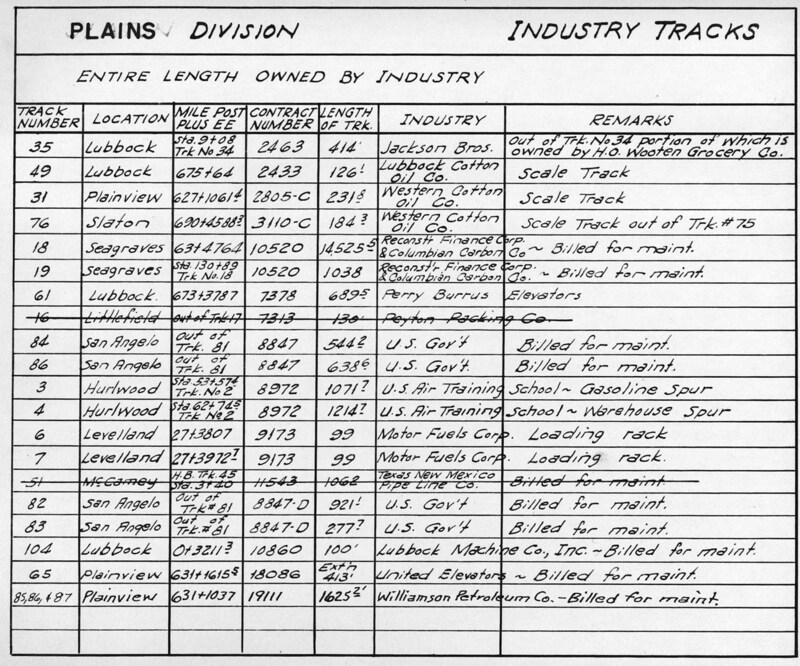 Partial list of Industry tracks on the Plains Division corrected to June 6, 1976. These tracks are entirely owned by the industry.